OK, so I successfully update my Developer Edition One (64 GB), and now none of my apps can't find any of thier related data (ringtones, Evernote database, all my pictures, etc.). If I go into Storage it shows I have 64GB, 25 GB is used (what I showed before the update), my apps are fine (and Email seems to be fine) but all of my other data seems to be in something called "Other" - almost 20 GB of it. Astro can't see it, it just shows there's an sdcard0 but basically nothing really in it. My pictures are all backed up so no issues there, but seriously WTF I'm gonna have to reconfig all my apps, and then have 20 GB of space eaten up by data I can't get to or remove? Been googling, can't find anything on this, no one else seems to have the problem. It's weird, because various apps are finding their data (Doggcatcher is working, Evernote is working) but all my media (pictures, music, ringtones) are just gone. Swiftkey couldn't find its language pack and I had to re-download. It's just a mess. I guess I'll just have to factory reset. This was a pretty large update (a major point release). Typically after an update like this I would recommend a factory reset, just to prevent any underlying framework issues from cropping up. Unfortunately, if you've searched through every possible place your stuff can be then I don't know what to recommend to not lose that stuff. I haven't seen any widespread reports of others having this issue, so it's likely a weird glitch type of thing that sometimes happens after an update. Also, FWIW, I always have stuff in the "other" category, but never as much as you do. Yeah me too, but not 19 GB I was wrong about Doggcatcher, it shows my lists and progress on ones I was listening too, but when I went to play one it started downloading it, it can't find its data either. My guess is this has something to do with multi-user profiles and my one just barfed for some reason during the update. I even hooked it up to my computer and can't find that 19GB of data anywhere. Oh well, a factory reset isn't the end of the world. Pulled the trigger. New phone day! Nah I don't think there will be one. Nothing wrong a factory reset if you don't mind setting things back up (I do it when I flash ROMs, which isn't as often as it used to be). i have 6.7 GB of used "other" space. not sure how much i had before 4.3, but it seems kinda high. What version did you come from? When I went from 4.1 to 4.2 that happened to me. Around 5 GB of data was inaccessible. So I used root explorer to find it and delete it. I can't remember what or where it was located. i came from the 4.1.2 version. i use clean master for this kind of stuff but in this case, it doesnt work. cleaned the cache and stuff but it doesn't appear to recognise this 6GB of "other" data. The update to 4.3 from 4.1.2 also messed me up with a number of apps, most especially Kindle, which is the primary reason I went to the One from the iPhone. Perhaps they shouldn't have skipped 4.2; an incremental move might have been wiser. I've slipped the AT&T sim back into the iPhone for now. I'll come back to the One when (if) they get this "update" right. Too old to waste time fighting with a phone. some people had issues with the kindle app even on 4.1.2.
sometimes apps are just broken when was the last time this one particularly was updated? It's been known to happen when flashing Roms you get duplicate system data somewhere. I assume you are using a custom recovery you can wipe your phone again from there to clear it out then it should be around 7GB. I was updating from 4.1.2 to 4.3. Thanks, a friend of mine mentioned Root Browser to me as well (after I'd already reset the phone tho ). I'll keep it in mind for next time, but in a way I'm kinda glad I did the reset because as Kevin mentions it was a pretty significant update. Personally I'm loving everything about this update. I haven't yet received the 4.3 update so my One is still running 4.2.2. I've just recently noticed that my storage is also messed up. 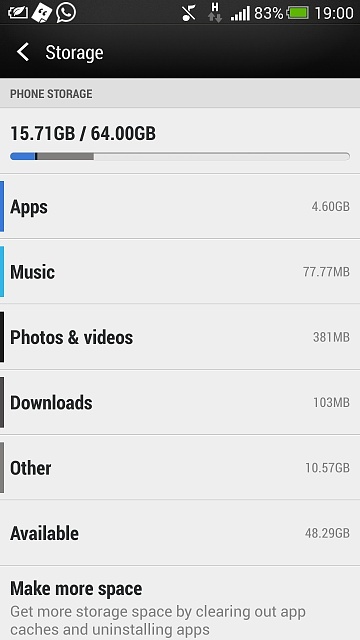 It says that 'Apps' have taken only 4GB of storage and 'Other' 10GB, whatever 'Other' is. I have 137 apps installed so it's impossible that only 4GB is used up by my apps. And has anyone figured out what 'Other' is? After upgrade 4.3, the "other" holds 24GB. I only have one pic, and less than 1GB apps. Also, I did factory reset. 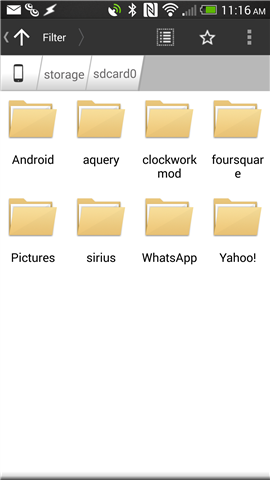 "Use a file manager with root explorer capabilities. I prefer root explorer but ES* and Solid should manage this too. Along with all your other folders. Legacy and 0 are the same. Leaving 0, legacy and obb UNTOUCHED". You can delete the rest, then u will get back the storage. I JUST noticed this today. I have a whopping 19gb taken up by "other". I JUST want some space back. Help!!! (In plain detail and newbie terms please! I have the same problem after putting a HTC One custom Rom on my Eco 4G Lte. I found a good partial solution, below. I had 2.1gb for App storage with 2gb in use. 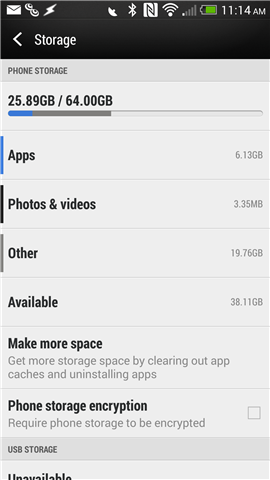 Internal storage had 15gb with 2gb used. And my 32gb sd card showed as 25gb free. And I couldn't install apps. It appears that the system volume mounts the photos and videos from the sd card as a symbolic link or something. And when the system calculates the free space, it includes the space used by the media on the sd card. I haven't found a way to fix this yet, as I don't want to break my phone. But to free up some app space, open a root explorer. Go to /data and there is a lost+found folder. In that is a ton of folders and files that linux found when rebuilding the drive after a hard crash or Rom install. I had over 12,000 files taking up 1.2gb of space. I deleted all the folders, but left the lost+found parent folder. Voila! I now have 1.1gb of free space for apps. If I find a fix for the media mounting inside the system problem, I'll post it. Hope someone else can assist here. can eveyone help me. my galaxy s4 led light doesn't turn off.